Marsh, James H.. "Barilko has won the Stanley Cup for the Maple Leafs!". The Canadian Encyclopedia, 25 January 2019, Historica Canada. https://www.thecanadianencyclopedia.ca/en/article/barilko-has-won-the-stanley-cup-for-the-maple-leafs-feature. Accessed 22 April 2019. Sometimes the past is interesting, not because of its long-term historical significance or because it might teach us some questionable lesson about the present, but simply because it contains wondrous reminders of the serendipity of fate. 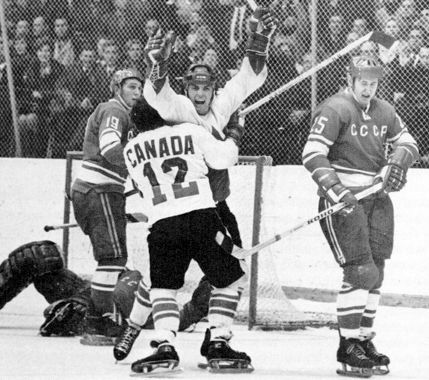 I am fascinated by a goal that Bill Barilko scored on 21 April 1951, not because it was a precursor to Paul Henderson's life-saving marker in 1972, or to Sidney Crosby's goal of redemption at the 2010 Olympics, but because I was there. There were officially 14,577 fans at that game — well, plus one, because my grandmother slipped me through the turnstile (the attendants all knew her by name) and squeezed me onto the bench beside her in the first-row greys, directly above the south blue line. I was seven. In those days, there was an imposing formality to the Gardens, encouraged by the militaristic owner and general manager of the Toronto Maple Leafs, Conn Smythe. Everyone dressed in their Sunday best, in suits, furs and fedoras. The intermission entertainment was by a band or orchestra playing live on the south balcony and mercifully, we were spared the ghastly noise of the piped music and shilling that corrupts the ears in stadiums these days. The only sounds were made by the contact and whistles of the game itself and by enthusiastic fans, who would not dream of disturbing their neighbours during play to buy refreshments. In moments of quiet, a garage owner by the name of John Arnott famously beckoned Leafs captain, Ted Kennedy, with a plangent, almost plaintive call, "C'mon.... Teeederrrrrrr.” The long climb up the Gardens stairs and through a warren of dark hallways was daunting to a boy, but I was rewarded by the view from the top into the massive dome held high, it seemed to me precariously, by slender bands of steel, and of the pristine sheet of ice below. Afraid of heights, it was years before I could look up at the catwalk over which Foster Hewitt made his way to his famous "gondola.” In fact, the very idea gave me nightmares. Granny, as I called Mrs. Annie Radford (she was not my real grandmother but a Good Samaritan who had partly adopted me), was a fanatic Leafs fan who had been a subscriber since the days when the Leafs were the St. Pats and played in the old Mutual Street Arena. She believed in the good Protestant values of work and humility and the industrious Leafs were made in that image. She was even a little suspicious of the fancy “dipsy-doodler” Max Bentley, for whom Smythe had recently traded a pack of hard-working drones. She hated the Montreal Canadiens, who were not only French and Catholic but in her eyes were unseemly in their flash and Latin tempers. For her, Maurice Richard was the epitome of evil, a "louse” in her strongest language. The fact that he was an incredible hockey player irritated her no end, and she could only put his success down to a pact that he had made with the devil. Newspaper reporters wrote afterwards that they had never heard such uproarious cheering as they heard that night, so it is not surprising that I have vivid memories of that game. 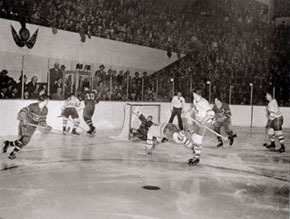 The Leafs led the series three games to one, but all four games had gone into overtime, with Sid Smith, Ted Kennedy and Harry Watson scoring the winners for the Leafs and the dreaded Richard for the Canadiens. Bill Barilko was a burly young man born in Tisdale Township, amid the mining camps of northern Ontario. His immigrant parents from Poland and what is now Belarus struggled to make ends meet. Bill and his brother, Alex, made do with hand-me-down clothes and skates from their father's boss. An indifferent student, Bill quit school at 15 and drove a truck for one of the local mines. He learned to skate in his mid-teens and although he never became a fluent skater, he made his mark on the ice as a physically tough player. The irascible Smythe saw an ideal in him ("if you can't beat ‘em in the alley, you can’t beat ‘em on the ice,” he had famously ordained) and in 1947 promoted him to the Leafs directly from their lowest farm team, the Hollywood Wolves. In those days, bodychecking was an art form, particularly the hip check, and Barilko became its master. More than once, the slick-skating Boston centre Milt Schmidt found himself airborne trying to ska­­­te around Barilko. Barilko and other toughs, like former Leaf Bill Eziniki, were "ruffians” to Granny. She reserved her praise for the classy Syl Apps and the tenacious Ted Kennedy. She encouraged the underdogs and unappreciated soldiers, like Hugh Bolton, master, in her mind, of the effective poke check, which obviated the need for violence. Furthermore, Barilko had an ethnic air about him that unsettled her British nativism. The game itself was as closely contested as the previous four. It was scoreless after the first period, which saw Leafs captain Kennedy carried off the ice on a stretcher (he would return). In the second period, the irrepressible Richard scored on a solo rush and Tod Sloan tied it for the Leafs. Barilko fueled my quiet adoration by getting into a fight with Tom Johnson and into a stick swinging duel with goalie Gerry McNeil. He seemed determined to pound the Habs into submission. Paul Meger put Montreal up 2–1 with a goal in the third period, and McNeil turned back Meeker, Kennedy and Timgren in successive assaults. Coach Joe Primeau pulled Leaf goalie Al Rollins with less than two minutes to go, and Sloan scored his second goal on a goalmouth scramble, tying the game at 2–2. The crowd erupted. Foster Hewitt, broadcasting to listeners across the country, described what happened at 2:53 of the aptly named sudden-death overtime: "Meeker went by the net. Centres out in front. McNeil fell. In front again. Watson shoots. He shoots, he scores! Barilko! Barilko has won the Stanley Cup for the Leafs!” Barilko had pounced on the centring pass, tripped, and backhanded the puck over the sprawling McNeil. "You see! You see! Barilko!”” I shouted to Granny. She was quiet. For her the thrill of victory was always far less pervasive than the relief of not losing. How much of the enduring appeal of that goal is owing to the subsequent tragedy is hard to say. Certainly no one foresaw that it would be Barilko's last game. The following summer, on 26 August 1951, Barilko and his friend and amateur pilot Henry Hudson took off from Rupert House (not far from where Hudson's namesake was lost) in a fish-laden, single-engine bush plane and disappeared into the tangled forest of northern Ontario. (The site of the crash was not discovered until 1962, 100 kilometres northwest of Cochrane.) I was devastated, flabbergasted, confused. How does a seven-year-old sort out the mythic implications of the death of a hero? Barilko's number 5 was etched onto my heart and even today is the nearest thing I have to a superstition. More certain is the effect on memory of the astonishing photograph of the goal snapped by Nat Turofsky on his Graflex camera, with such exquisite timing that he caught the puck in the net before the goal light had flashed. McNeil is planted on his seat, having fallen while stopping Meeker's shot at goal. Richard waits for a pass he will never get. Meeker will never see the moment of glory, as he is plastered against the boards by Tom Johnson. Barilko is suspended mid-fall, frozen in time, forever young.